Going back on its initial findings, DENR says samples taken near the site of the Dan River coal ash spill show arsenic levels four times higher than the state human health standard. Updated Feb. 10, 12:45 p.m. The N.C. Department of Environment and Natural Resources reported Friday afternoon that their tests from Monday and Tuesday of last week, the days following the Dan River coal ash spill, showed arsenic levels in the Dan River four times higher than the state water quality standards. This is big news. For five days, the water reports from NC DENR said that arsenic levels were below drinking water standards when they were actually four times greater. Arsenic is a poison that can cause cancer and even death when consumed in high doses or over long periods of time. An NC DENR employee claims to have accidentally compared the sample results with arsenic standards for aquatic life instead of human drinking water standards. They changed the report on Friday without alerting the public of the mistake. Read more here. The City of Danville’s water intake is just 20 miles downstream from the spill, but Danville city officials maintain that treated water at the plant did not exceed the arsenic limit on Tuesday. The EPA will release it’s test results soon. See a map of their sample sites here. A map of sites we tested can be found here. Coal ash ponds across the state contain arsenic that leaches into groundwater, posing a risk for neighboring communities who drink, bathe, and cook with water containing elevated levels of arsenic, heavy metals, and other toxic chemicals. Water samples from the recent coal ash spill illustrate that coal ash contains hazardous toxins that have the potential to poison North Carolinians’ drinking water. 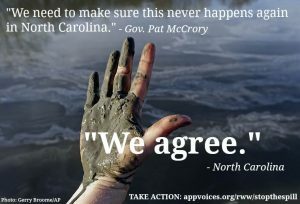 Tell Duke Energy it’s time to clean up their coal ash and stop putting our water at risk. Updated Feb. 7, 5:00 p.m.
It’s been five days since the massive coal ash spill at Duke Energy’s plant on the Dan River, and Duke still has not stopped the flow of coal ash, though it has diminished considerably. The N.C. Department of Environment and Natural Resources and the Waterkeeper Alliance released the results from their water testing yesterday. Read NC DENR’s results here. Today, Appalachian Voices released our own water testing results which show values for several contaminants that exceed federal drinking water standards. For example, the arsenic level at the spill site was 95.1 parts per billion, nine and a half times the recommended drinking water standard. Downstream samples also exceeded the federal recommended drinking water and freshwater standards for aluminum, iron, manganese and lead. Read our full results here. These results show that the Dan River has been negatively affected by the spill, but there is much more testing that needs to be done, since there are numerous, potentially harmful pollutants that have not been tested for, such as polycyclic aromatic hydrocarbons and volatile organic compounds. 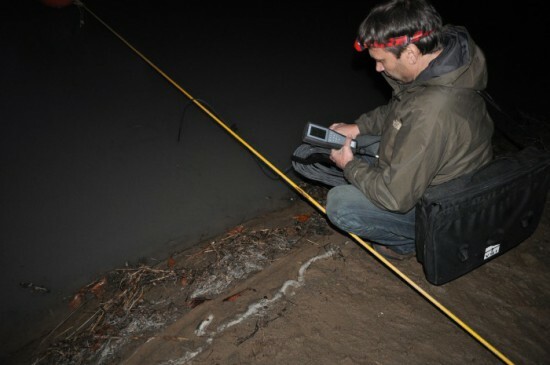 The water quality results from different organizations vary, however, this is due to the method of sampling. Appalachian Voices and the Waterkeeper Alliance chose to test unfiltered water because this better demonstrates the effects on aquatic life in the river. NC DENR chose to filter their water samples, which removes coal ash sediments. This is an accurate way to test the safety of drinking water, which is being filtered at the Danville, Va., water treatment facility. The results of these tests should be a wake up call. 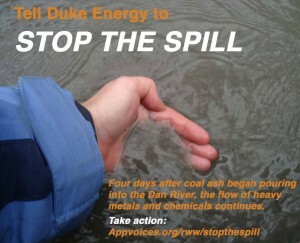 The spill in Eden, N.C., is an example of the threat coal ash ponds across the state pose. Tell Duke that it is time to protect our water resources from the dangers of coal ash once and for all. Updated Feb. 6, 1:00 p.m.
Four days after the Dan River coal ash spill, Duke Energy still has not successfully stopped the flow of heavy metals, polluted water, and chemicals into the Dan River. Take action by clicking here or on the image above to send a letter to Duke Energy telling them enough is enough, it’s time to clean up the coal ash threatening North Carolina’s waters. 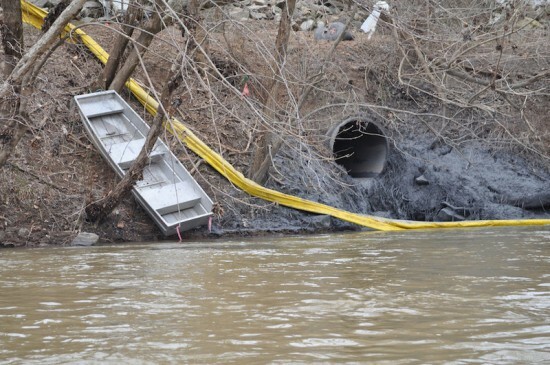 A ruptured storm water pipe was quickly identified as the source of the coal ash polluting the Dan River. But so far, there has been no solution to completely stop coal ash from reaching the river. Update Feb. 5, 5:00 p.m. Since Monday night, Appalachian Voices has been on the scene of the massive coal ash spill that originated at Duke Energy’s retired Dan River Steam Station and continues to pollute the Dan River. At the site of the spill and for several miles downstream, our water quality specialists have been collecting water samples and documenting the spill. Check out our Flickr for the most recent images. Greenpeace has also captured amazing aerial views of the spill, available on their Flickr. In addition to documenting the spill, Appalachian Voices’ North Carolina campaign coordinator, Amy Adams, and Director of Programs Matt Wasson have been speaking with reporters to ensure that citizens are informed of the spill and continue to receive accurate information. Check out some of the stories here, here, and here. The N.C. Department of Environment and Natural Resources states that the water in the Dan River is “NOT safe” and that they will receive lab results for heavy metals tomorrow. The city of Danville, Va., says that their water treatment facility has been able to treat the coal ash contamination thus far, and that the water coming from their facility is safe to drink. But further downstream, officials in Virginia Beach halted water intakes on Lake Gaston, a reservoir linked the Dan River Basin, to assure residents their drinking water would not be contaminated by the spill. More than 73 hours later, Duke Energy still has not successfully stopped the flow of coal ash coming from the ruptured storm water pipe that runs under the pond. Since Sunday night, coal ash has been spilling into the Dan River from a coal ash pond at Duke Energy’s retired Dan River Steam Station in Eden, N.C. The spill began when a storm water pipe under one of the plant’s coal ash pond burst, causing solid coal waste and toxic water held in the basin to flow through the pipe into the river. Duke estimates that up to 27 million gallons of water from the basin and as much as 82,000 tons of solid ash have entered the river. But the company still has not successfully stopped the flow, according to Duke spokeswoman Erin Culbert. Duke did not publicly report the spill until after 4 P.M. on Monday evening, though it was first noticed by a security guard who saw that the water level in the ash pond was lower than usual around 2 P.M. on Sunday. Throughout the day, residents saw the Dan River changing colors and ash washing up on the river banks. Duke has not released any water testing results, despite the high levels of toxic chemicals, including arsenic, selenium, mercury, lead, and boron, present in coal ash. The drinking water source for Danville, Va., is located just twenty miles downstream from the breach. Although Duke claims that the dam itself, which is holding back 27 acres of coal ash, remains secure, they also report that erosion has occurred on one side of the dam. The ash basin is rated “high hazard” by the EPA meaning that dam failure would likely cause serious property damage and human death. “This is the latest, loudest alarm bell yet that Duke should not be storing coal ash in antiquated pits near our state’s waterways,” says Frank Holleman, an attorney for the Southern Environmental Law Center. Duke is currently being sued by the state for unpermitted coal ash discharges at all 14 of its coal-fired power plants. Although seven of the plants are retired, the coal ash remains on site, posing a serious danger to neighboring residents and North Carolina’s surface and groundwaters. There are 27 coal ash ponds in the state, many of which are just as likely as the Dan River pond to breach and cause serious damage and loss of human life. Even when coal ash is properly contained, the EPA reports that residents living near coal ash ponds are 9 times more likely to develop cancer than someone who smokes a pack of cigarettes a day. This spill comes only four months after coal ash from Duke’s Sutton Power Plant contaminated the groundwater of a community near Wilmington, N.C., forcing residents to switch to another drinking water source. Duke Energy claims that they are “committed to closing ash basins in a way that protects groundwater long-term and is prudent for customers and neighbors” and yet all of their coal ash ponds are currently leaking into ground and surface waters. This is not the first time that coal ash has spilled into waterways, but it’s time for Duke Energy to do its part to make it the last. Visit Appalachian Voices’ Red, White, and Water page to learn more about our work to pressure Duke Energy and other coal-burning utilities to clean up properly store coal ash in dry, lined pits away from precious water resources. A sunny-spirited North Carolinian with a passion for hiking, viola, ceramics and poetry, Sarah joined Appalachian Voices as our 2013-14 Americorps Education Outreach Associate and later served as our N.C. Coordinator working on coal ash cleanup and pipeline awareness from 2014-2016.